The forced resignation of Turkey's Prime Minister Ahmet Davutoğlu suggests only one thing--President Erdogan, who is totally absorbed by his lust for power, will tolerate no one in his government to deviate from any of his political positions. Prime Minister Davutoğlu was no exception. Although the Turkish constitution grants the Prime Minister executive powers while leaving the role of the president largely ceremonial, this is not what Erdogan had in mind when he asked then-Foreign Minister Davutoğlu to form a new government following the last election. Erdogan's ambition and aggressive drive to spread his Islamic agenda are what has determined every political move he made. Seeking to constitutionally transfer the executive authority of the country to the Presidency is the final step to legally consolidate his power, albeit he was already exercising such power throughout his tenure as Prime Minister for eleven years. For more than 15 years, Davutoğlu served Erdogan with the utmost loyalty--first as his top foreign policy adviser, then his Foreign Minister, and for the past two years as his hand-picked Prime Minister. Erdogan chose Davutoğlu for this post precisely because he expected him to continue to be his 'Yes man.' 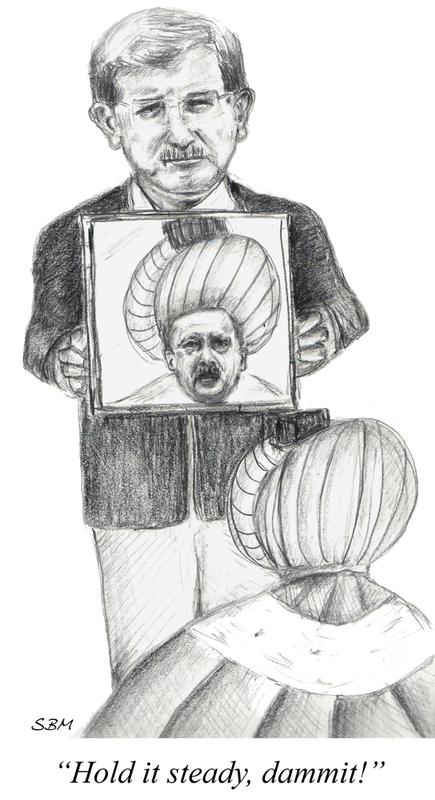 Being that as Prime Minister, Davutoğlu would assume leadership of the AK Party, Erdogan expected him to push for the transformation of the largely ceremonial Presidency into the most powerful executive position in Turkey, which Davutoğlu pursued in a lukewarm manner as this would constitutionally diminish his own powers considerably. Not surprisingly, once Erdogan assumed the Presidency, he continued to chair cabinet meetings and even established a shadow cabinet with a handful of trusted advisors. He pointedly sidelined Davutoğlu, who quietly resented Erdogan's usurpation of the role and responsibility of the prime minister as if nothing had changed. I have known Davutoğlu from the time he was the chief advisor to Erdogan and I found him to be a man of integrity and vision, always a moderating force, and committed to making Turkey a stabilizing regional power and a significant player on the international scene. Moreover, by playing such a role, Davutoğlu was also very consistent with his commitment to realize his political philosophy of having 'zero problems with neighbors', which initially led to Turkey's friendly and cooperative relations with most of its neighbors. Erdogan's ambition to become the kingpin of the region through his brazen political approach, however, did nothing but create problems with every neighboring country. A former top Turkish official told me that had Davutoğlu been given the flexibility to carry out his foreign policy vision, Turkey's regional standing would be completely different today. During the past two years, however, several conflicts between the two began to surface. Whereas Davutoğlu sought to renew the peace negotiations with the Kurdistan Workers' Party (PKK) in the search for a solution, Erdogan not only refused but vowed to wage war until the last PKK rebel is killed. In addition, although Davutoğlu said nothing publicly about Erdogan's systematic attack on the free press, the jailing of journalists, and human rights violations, he disagreed with these unlawful measures and failed in his efforts to quietly persuade his boss to ease the pressure on the press. Erdogan's insistence on silencing any criticism and the constant chipping away of what is left of Turkey's democracy has basically sealed off (contrary to what is being said publicly) any prospect for Turkey to become an EU member, which Davutoğlu sought to realize with zeal. On top of all that, Erdogan is now seeking to strip Kurdish lawmakers of their political immunity to make it possible to charge them with being aligned with the PKK who are fighting for semi-autonomous rule, to which Davutoğlu surreptitiously objected. It is now being left to the next prime minister to engineer this unlawful scheme to meet Erdogan's draconian will. Finally, while Davutoğlu was busy in his effort to achieve an agreement with the EU to take back illegal migrants in exchange for visa-free entry for Turkish nationals to the Schengen region, Erdogan publicly belittled Davutoğlu's efforts to deprive him of any political gains that he could derive from his success. The leader of the opposition Republican People's Party, Kemal Kilicdaroglu, condemned the way Davutoğlu was forced out, stating that "Davutoğlu's resignation should not be perceived as an integral party issue. All democracy supporters must resist this palace coup." Interestingly enough, in what was seen as a farewell speech to the parliament, Davutoğlu stated that "No one has ever heard a word against our president from my mouth, my tongue, my mind--and no one will." To me and many other observers, Davutoğlu's words expressed the precise opposite of what he appeared to be saying: that Erdogan is beyond criticism. There was no better diplomatic way of putting it lest he be accused by Erdogan of treason, as customarily befalls anyone who opposes his political positions on any issue. Due to the turmoil throughout the Middle East, the influx of millions of Syrian refugees and the battle against ISIS, Turkey's role has become increasingly important. Although the United States and the EU have grown weary of Erdogan's absurd conduct, they feel compelled to deal with him, however distasteful that might be. Leave it, of course, to Erdogan to drain every ounce of blood from Western powers to serve his personal agenda. With the departure of Davutoğlu, and a rubber stamp AK Party, Turkey has become a de facto dictatorship, and there is now no one to stand in Erdogan's way. The Turkish people should once again take to the streets but this time around they should remain persistent until Erdogan relents or resigns. Otherwise, Turkey will continue to rapidly race toward an ever bleaker future where freedom will be a thing of the past and an authoritarian regime led by a ruthless leader sets in.